Have you ever realized how elated you get when you give? Giving is indeed one of the best investments an individual can make towards achieving genuine happiness. True giving comes from the heart, with no expectation of reciprocation. It is manifested with kindness and generosity and there is no substitute for this ‘Good Karma’. It just makes you feel good. 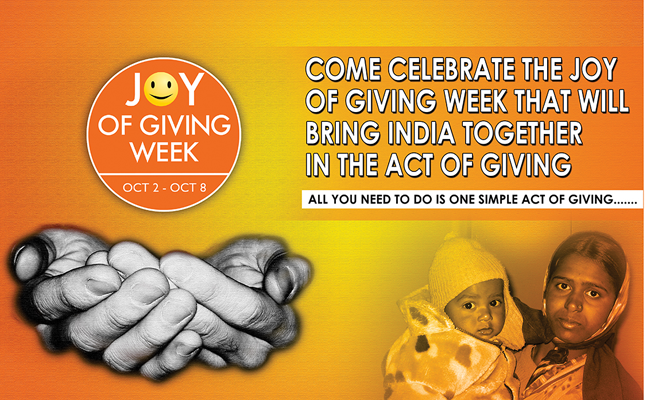 This month we celebrate the festival of giving also popularly known as the “Joy of Giving” festival. The festival begins on Oct 2nd– the birthday of our father of our nation MK Gandhi and continues till the 8th of October. Being the season of giving, I call upon one and all to share love and spread happiness in the lives of those who are far away from these pleasures. Let’s share our happiness with those lesser privileged people who ask nothing but love. There are various ways in which you can participate in this festival. You can participate by sharing your Old clothes with people who require the most. GOQii has partnered with Ratna Nidhi Charitable Trust for this drive. With this drive we would be helping RNCT to distribute usable garments to the poorest of the poor of all ages. To ensure that it reaches out to more and more needy people, RNCT will further distribute the collection to grass root organizations and institutions working with the underprivileged group of society across the country. How do we participate in this drive?